Last month we had an idea to start a Rig-of-the-Month thread, so that’s what we did! For a first go-round, it was roundly a success – with 22 entries in all. The rules are pretty simple. Post a picture of your system in this thread. Photos must be reasonable sizes – 1000px x 1000px max. Maximum three photos, so choose wisely. Pictures must be uploaded to the forum. If your photo is not uploaded to the forum, your entry will be deleted. If you need help with that, don’t hesitate to ask. Assuming there are plenty of entries, after two weeks’ish, forum staff will decide on the top 3-5 systems out of the submissions. Once the top systems are chosen, a poll will be added to the thread for everyone to vote on their favorite. He or she whose rig is voted the top will have their system featured in a frontpage article and a post on our Facebook page. This isn’t only about how powerful your system is, or how good it looks, or how original, or how whatever…it’s all of those things combined. If you don’t have a very powerful system but it looks good, post it. If you have an original looking system, post it. If you have a ZOMG look how powerful it is system post it. Anything goes. There are no high stakes, just the honor of having your system posted on the front page and our Facebook page. Since we hope this becomes a semi-regular thing, winners must sit out the next six Rig o’ The ___ contests. You can still post to show people what they should strive for, but they’re ineligible to win again for six months. As you can see, this isn’t intended to necessarily be every month, but since people seem to like it and as long as things don’t get in the way, we’ll try to make it every month. There was a lot of competition for this; and out of twenty two, forum staff chose five to compete for the top. There can only be one winner though, and after well over a hundred and forty votes, that winner is…..(drumroll please!)…. 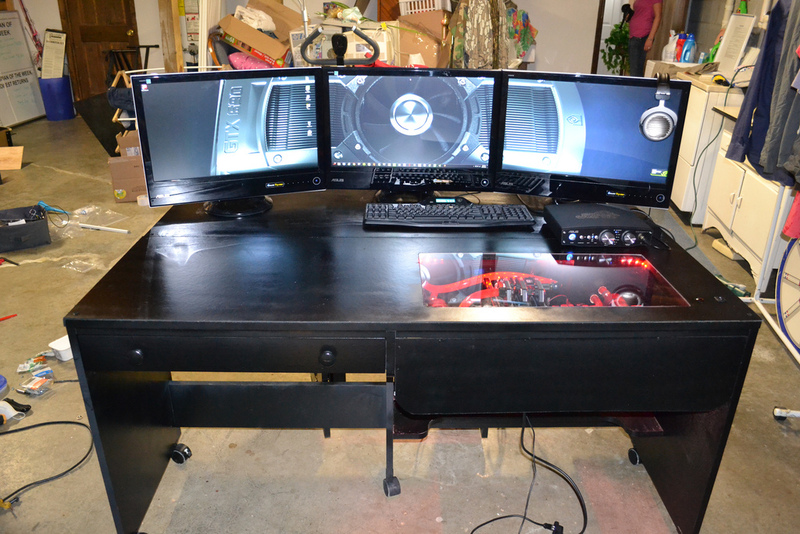 This beautiful build was installed in an old sewing desk and comes complete with plenty of top-of-the-line hardware. The water loop consists of Koolance blocks, EK reservoirs, Swiftech pumps and Black Ice radiators. 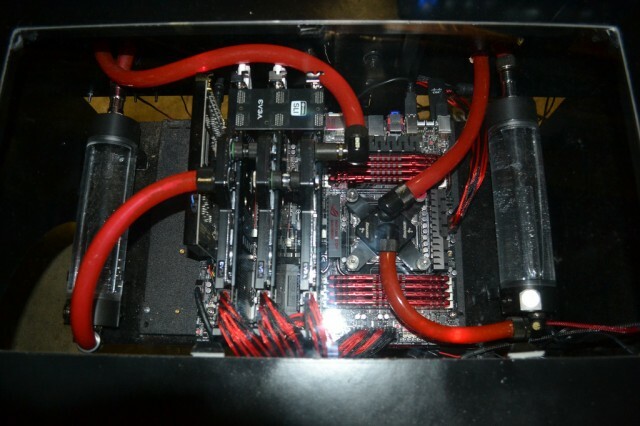 You can check out more photos of his winning build in its project thread. Congratulations and great work mwindham08! Per the rules, mwindham08 can’t participate for the next six competitions, so the rest of us will have a chance next month. 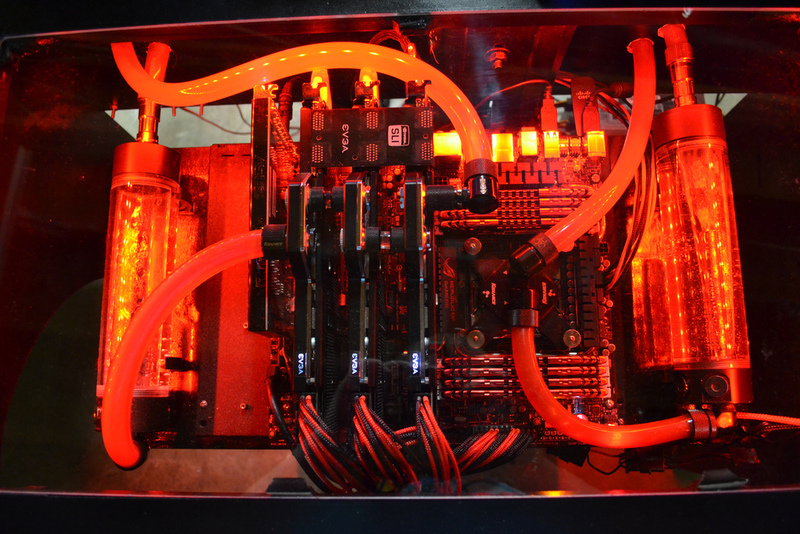 Be sure to stop by the September Rig-o’-the-Month thread and enter your system! Congratulations mwindham08! I think the votes reflect there was something special about your build. :salute: We didn't really give any direction to the voters about what qualities to vote on, so it was really interesting to see what the forum members used their vote for! Also props to the competitors - it was a great field to choose from. Maybe next month we'll find a way to open voting to the public as well - that way members as well as visitors can vote! Thanks for all the votes and compliments everyone! They have really made the effort I put into it worthwhile. I'm looking forward to Septembers contest starting so I can see other member's awesome builds. Oops, forgot your title. You're now permanently a rig-o-the-month winner, until you want it changed. The September thread is up, enter away! Those are hydrocopper cards so they have the swiftech blocks. I doubt any koolance card is going to have an evga logo on them. Evga used to sell the swiftech blocks by themselves , might check their site or eBay. Think this is pretty damn awesome, curious though are the power buttons on the right near the bottom of the window? My wife decided we should spend a few weeks living at my in-laws this summer. Needless to say I had to find something to occupy my time or I was going to go insane, so I started working on this build in their garage. At one point I had a few case stickers that I was considering putting somewhere when my father in law came in with a leaf blower and sent them to the farthest corners of the room...I never did find them all. When we left though I took it with me and the desk is now back in my home and out of their garage...thank goodness. And yes the power button and led on/off switch are on the far right, I put them over there that way I never accidently hit them or drag things over them all the time. I can reach both without leaving my chair so I think it worked out pretty well. That's a sweet looking rig, i usually keep mine so clean you can eat off of it... For the 1st few months, now it is full of cobwebs.